For Marge- I stumbled upon the perfect color green dress, which was unfortunately about 4 sizes too small. I bought it anyway and opened up the seams and added strips of green fabric down both sides of the dress, creating a perfect fit! Next I found a red pearl (fake obviously!) necklace and yellow tights. 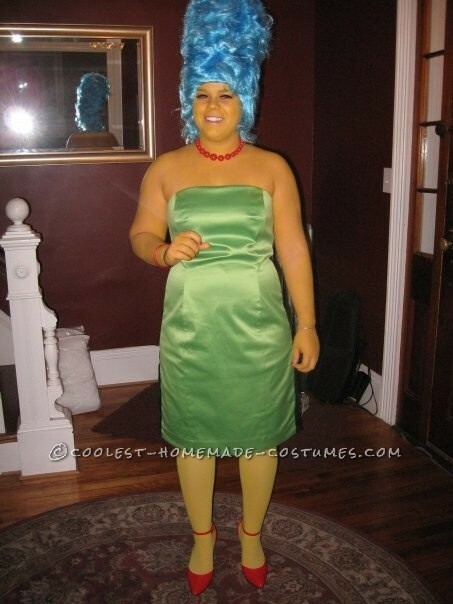 Marge’s signature piece- her blue hair, was purchased at a local party store. For Homer- Easy peasy!!! We bought a white polo shirt and already had a pair of blue Dickie pants. 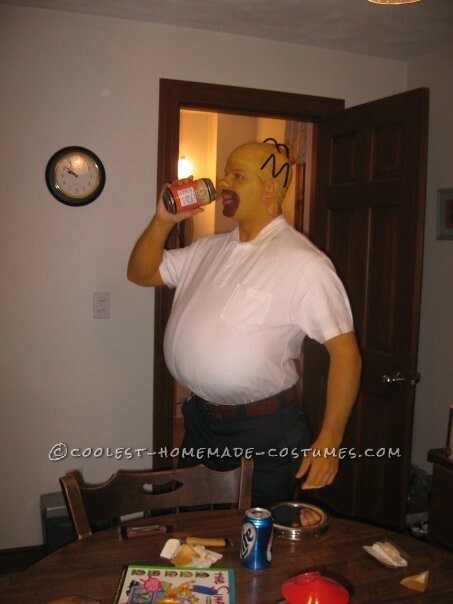 For Homer’s beer belly, I stuffed a long fabric hobo pocketbook with clothes and he wore it around his neck, causing the full bag to fall perfectly in place to create the perfect gut. 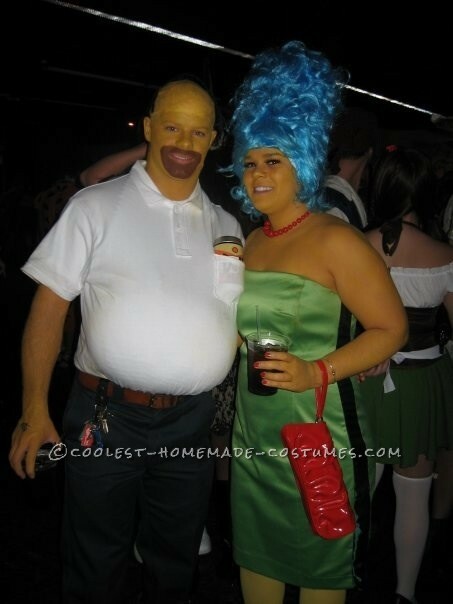 Next, I got a bald wig and glued on black pipe cleaners for the little hair that Homer has left. A Duff beer can was a necessary accessory! And for the finishing touch- yellow paint…ALOT of yellow paint!! We each used about 6 tubes of yellow face paint as we COVERED our faces, neck & chest and our arms & hands. 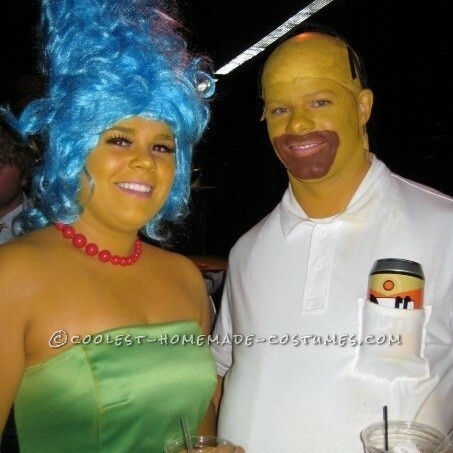 When we walked into the Halloween party- everyone at the bar treated us like celebrities!!! Total strangers were coming up to us all night asking to take pictures. Friends are still talking about it! The real adventure, though, was after everything was all said and done. Getting home well after hours, we took a shower to wash all the yellow off and went to bed, once again human-colored…or so we thought!!! The next morning, EVERYTHING was yellow!!! Bed sheets, shower, door knobs, the entire car, kitchen cabinets and counter…everything! But it was well worth it!! !